“Kaleidoscope” hand carved wooden box. Length: 13,5 cm (5,31”), width: 11,6 cm (4,57”), height: 6,8 cm (2,68”). Length: 10,8 cm (4,25”), width: 9,4 cm (3,7”), height: 1,6 cm (0,63”). Finish: milk paint, amber varnish, linen fabric liner. Tatiana, you have the most interesting and unique designs. Do you do the design drawing, too? Yes, I do. But this pattern isn’t on paper yet. 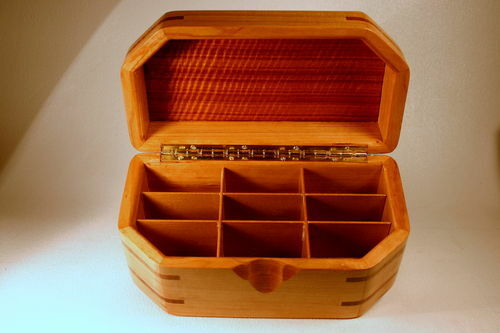 Tatiana, this is another outstanding box and I love the beautiful pattern. Your boxes display a wealth of fine details and craftsmanship. You are truly an artist; your work will be collectable, probably within your lifetime! WOW! +++ As great as they have all been this one surpasses even your others! Tat, I like the use of the peg to keep alignment of the lid and the bottom. Nice idea. Have you considered routing off the inside corners of the bottom and lid of your box to make it more finger friendly?